Sources in the industry are saying that Huawei is looking to beat Samsung in the run up to launching the first foldable smartphone. The flexible OLED panels for this device will be made by BOE and Huawei is expected to launch such phones in limited quantities much before Samsung in early 2019. Huawei is reportedly looking to take the crown of being the first OEM to dish out a foldable smartphone beating Samsung to the race. Nikkei quotes analysts and industry sources who are aware of Huawei's plan for a foldable smartphone. Having recently been granted a patent for foldable displays, Huawei is turning to homegrown supplier BOE for sourcing foldable OLED panels. Although expected to be made in small numbers, the whole plan is to beat Samsung to have the first foldable phone. Huawei's planned volume could be limited to some 20,000 to 30,000 units, or even less, for a small group of first-wave adopters. The effort is mainly to demonstrate its technology capability and to attract the industry's attention and media coverage." Supply chain sources are, however, wary of the display quality and feel that in the rush to be the first, Huawei might not match up to Samsung's offering. BOE, worldwide major in producing TV screens, is looking to compete with Samsung in OLED. The raison d'être for BOE to rush these screens to market is not profitability but to prove its worth to other clients such as Apple. Meanwhile, Samsung is fully into producing a foldable smartphone in 2019. Analysts say that Samsung's foldable Galaxy would feature a '7.3-inch seamless display and the folded product will be no thicker than an iPhone 8 or 8 Plus.' This matches with earlier reports of a 7.3-inch foldable screen and flexible batteries being developed for the same. 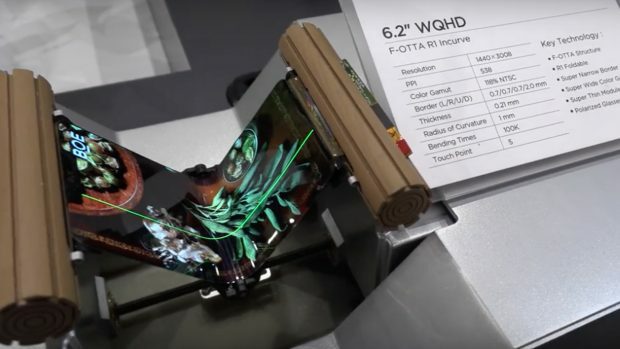 Also being quoted is the fact that Samsung's display can be folded up to 20,000 times and the device is likely to be priced between US$1,500 to US$2,000. The company is expecting to ship around 3 million units of the foldable Galaxy next year.